My husband and I read the Bible every morning, but since I had my tonsillectomy, he has been doing all the reading. Yesterday, he went to the grocery store without me (usually we go together). Tomorrow is my youngest son’s birthday and even though we had planned several weeks ago to take him to breakfast, to a movie, then to a sushi place for lunch, I don’t think I will be able to go because I get tired very quickly now, plus I am still in pain. I almost feel like I am standing still and everything else is moving around me. Life continues to happen. I can see how someone who is having health problems can become depressed—it would seem like the “natural” reaction. For the past few days I have been thinking about my father-in-law. I can’t believe he endured so many years of pain and yet continued to smile. 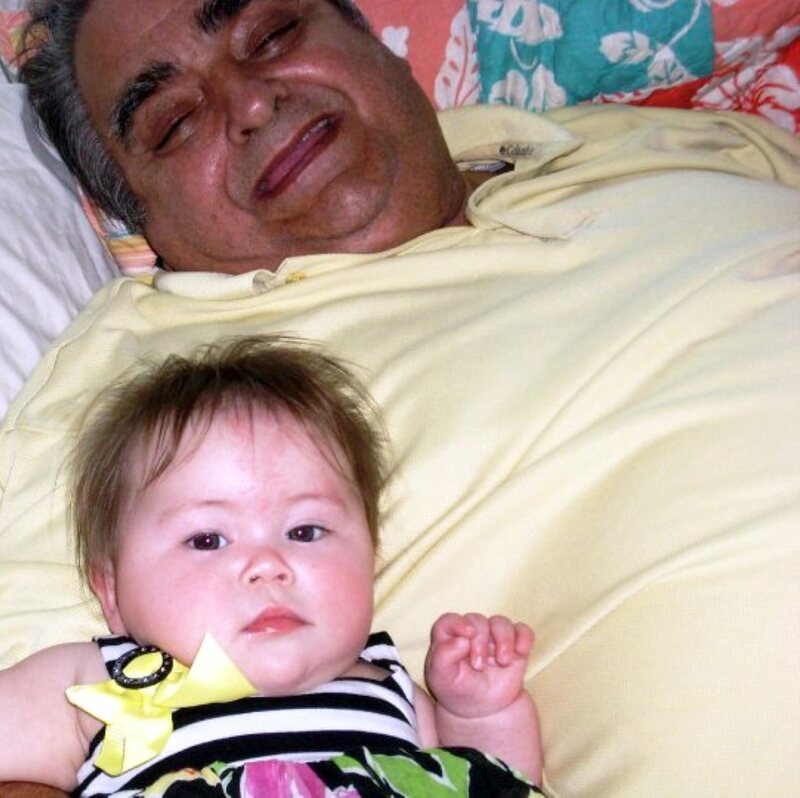 This is a picture of him with his first great-grandchild, my granddaughter. He was lying on his home hospital bed when the picture was taken. He was bloated from the medications and he had discoloration around his lips, but the joy he had within radiated from his face. It’s been only a week of this misery for me and I am finding it very difficult to stay “positive,” even knowing that my health issue is only temporary and that I should be much better in another week. I find myself whining, crying, and sulking and it’s been only seven days! When I compare my seven days to the twenty years my father-in-law suffered, all I can (and should) say is: “…I will cover my mouth with my hand. I have said too much already. I have nothing more to say” (Job 40:4-5, NLT).